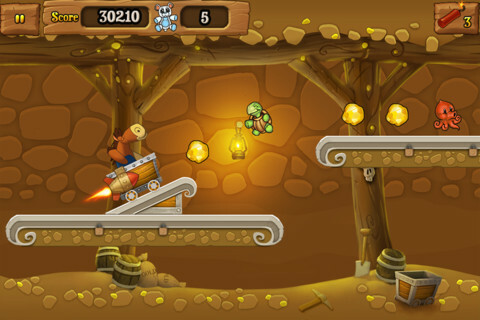 Plushed Gold Fever is a free platformer game for the iPhone and iPod touch from Blacksmith Games. In this app, a grumpy Voodoo mouse drinking in a tavern has had enough of the plush toys around him so he mixes up a potion, and the plush toys are swept away to all parts. Our Hero the plush horse arrives late, and sets out to find the banished plush toys. As he looks for them he has to duck and dive as he makes his way though the mine that has many obstacles, and collecting gold along the way. As you go, things can be upgraded with the gold he collects, but be aware, it is hard to accumulate lots of gold. Plushed GF is a game of three’s, if you collect enough gold you can unlock the other two characters, a pig and a cow, and there are three different game play modes. There are the Gold Cart, Gold Grabber and Gold Smasher options to make your way through, with the Gold Cart being the most fun. I found the other two to be a little boring, and although I was quickly sucked into Gold Cart even that became a little boring after a while. The graphics are top notch with hand drawn characters and plenty of different plush toys to collect. The color and lighting are perfect for this game, but strangely enough it only works with one orientation – not a huge issue, but definitely a little odd. The sounds in the game are good, but the music is not particularly pleasant – I opted to turn it off after just a short while. It sounds like some cheap old attempt at country music. The game does work on an iPad, but it is not universal and is made for the iPhone. There are in game purchases for more gold, not something I like to see but it is becoming a popular trend. The game was free when I picked it up, so if you are looking for something to play with pop into the AppStore and give it a try. It is worth a few minutes of your time. 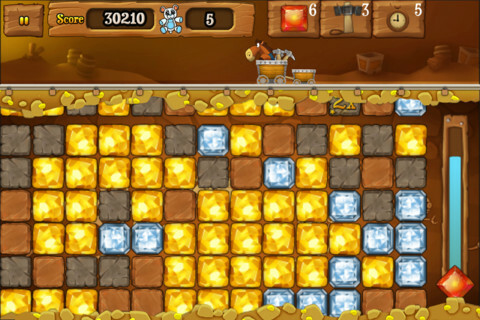 AppSafari review of Plushed Gold Fever (iPhone) was written by Richard Best on September 13th, 2011 and categorized under App Store, Free, Fun, Games, Platformer. Page viewed 4460 times, 2 so far today. Need help on using these apps? Please read the Help Page.